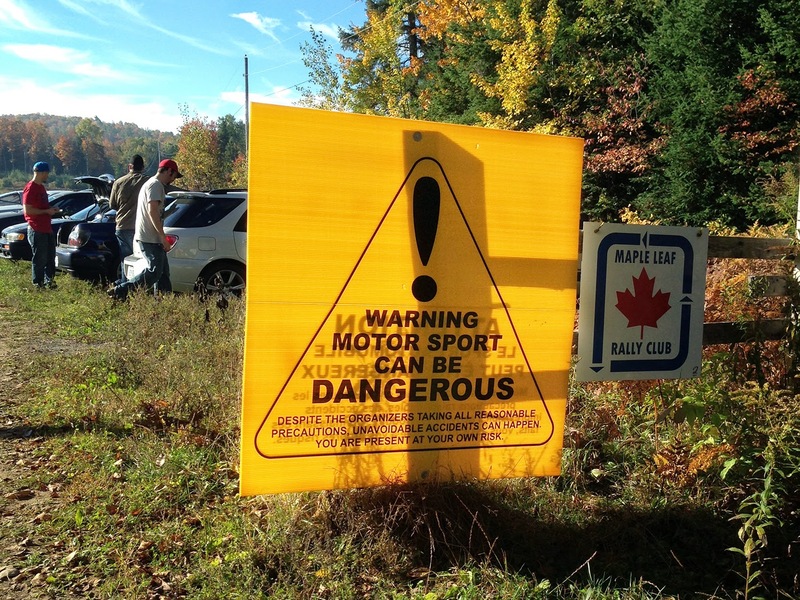 We arrived just in time for the driver’s meeting at 9am, and how surprised were we to find the organizers of the Picton autocross there! Maybe they changed the Picton date so they could attend the rallycross… Funny enough, they also decided to give rallycross a try and pitched in for an Impreza wagon. Although the car they bought was a GC and cost about half of ours. At the driver’s meeting we realized that the course we’d be doing was different from the winter one, in that it was longer and also included a forest section. As in driving sideways… through a forest… with trees and such. We were quickly reassured by the organizers that all the dangers have been clearly marked with pylons, and that cars never roll over at their events – they just “tip over” into the soft, fluffy sand. Wonderful. Out on the course, it wasn’t very clear as to why the 2 second penalty for cones was in place. The cones were set directly in front of trees, rocks, sand dunes, sharp drop-offs... I’m pretty sure that if you hit them you’d have bigger problems to worry about than having 2 seconds added to your time. After a few runs, it was clear that our times weren’t particularly great. I could blame the crappy 10 year old Korean winter tires, our useless brakes, the fact that we ran with 3 people in the car, our tired motor, but it was probably more down to not having enough cojones to drive flat out through the forest section. Especially one chicane where the ideal line lay as close as possible to two sand dunes, and if you get it wrong by several inches, you’re “tipping over”. One of the guys in a GC coupe was barreling down into the second to last corner as his front wheel snapped off, and went on its own way for a good few hundred meters until it finally realized it needs a car to move any further. It was a steely that completely sheared off the lug nuts and flew off. Studs still in place, and nuts bolted down. 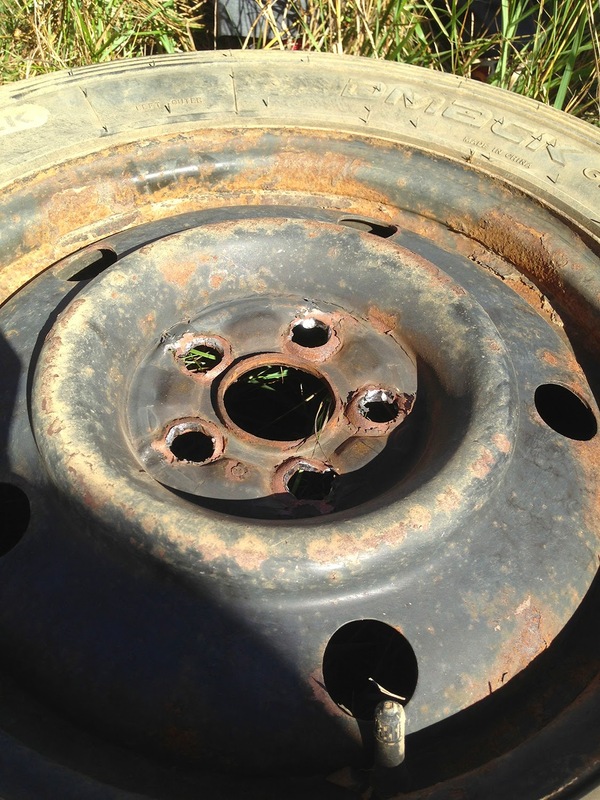 This is the third time I see this happen to steelies, and is the reason we run aluminum Outback wheels. The guy was dragged off the course by a tow truck, got a new set of wheels on, and was good as new, save for a fender the wheel bent as it flew off. We had a bit of a moment with our car too. Coming off the course after our very last run, we parked in the paddock, and popped the hood to give it the usual glance-over to make sure the motor was still under there. As we looked in, we saw a bit of smoke coming from the back of the motor, pretty much where the transmission was. Strange, what the hell could be smoking there? While the guys continued scratching their head, I thought I’d come around the car and have a peek underneath. I got on the ground and… Fire! The cat got so hot, it set the dry grass in the paddock on fire! I hopped into the car, popped it into reverse and dumped the clutch to get it away from there as the guys rushed over to our tool stash for some water to put the fire out. I quickly remembered the story of a 12 week old Porsche that burned down to the ground at Shannonville from the very same cause. Needless to say, we now carry a fire extinguisher to every race.